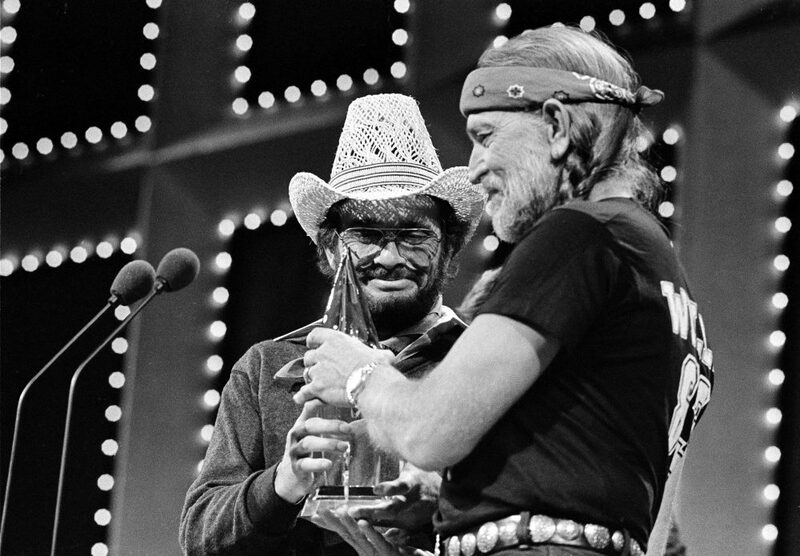 California’s Merle Haggard and Texan Willie Nelson, seen here accepting their Duo of the Year award at the Country Music Association Awards in 1983, showed how America’s two biggest states could learn to harmonize. Photo courtesy of Mark Humphrey/Associated Press. Our nation’s political leaders are committed to dividing the country; their business model for elections and fundraising depends on ever-greater polarization of the American electorate. And so the American government’s mission now amounts to three things: mismanaging entitlement programs, handing our tax breaks to donors, and throwing trillions of dollars at endless wars that should instead go to our infrastructure. So if this country is ever going to put itself back together, it’ll be up to your two states. You’re the two most successful examples of American states—capable of attracting millions of Americans and their dreams. Sure, you represent different constituencies and versions of the American idea. Texas represents the cheap, lightly regulated, freedom- and gun-loving counterpoint to California’s progressive cultural and technological powerhouse. But you have one big thing in common: the American predicament. You are both nation-sized places stuck inside an even larger country. California, with nearly 40 million people, has the world’s fifth-largest economy; while Texas, approaching 30 million people, has the 10th-largest economy in the world. If you were presidents and your states were countries, they would be the 38th and 49th most populous nations on earth, respectively. All of which gives California and Texas a common enemy: federal power. For more than a century, whichever party is in power in Washington has seized more authority for the federal government. Recent presidents of all stripes—from Bill Clinton to Donald Trump—have ruled increasingly by executive order and other dictates. Quite often, this increasingly dictatorial federal power has been aimed at the two of you. Now that Republicans are in power, it’s California’s turn to be targeted for its progressive policies on climate, pollution, immigration, and health care. So now the state gets together with its Western (and Northeastern) friends and resists with lawsuits, more than two dozen against the Trump administration. This endless cycle of litigation appears to be escalating so fast that The New York Times called it a legal civil war. All this fighting isn’t good for the country, or your states. It takes time and resources away from your states’ efforts to improve the lives of your citizens. And the resentments create internal divisions. Both of your states have movements seeking secession from the United States. And the fights with the federal government often inspire legal battles between your states and their cities. The good news is: You don’t have to live like this! Together, the two of you can break the cycle. That’s why you need a peace summit. The goals of the talks should be twofold. First, for both states to reaffirm their American-ness and commit to peaceful coexistence. Second, for both states to work together to reduce federal power, and enhance the independence of states and their local communities. This must go beyond reaffirming the 10th Amendment to the U.S. Constitution, which reserves for the states the powers not given to the federal government. California and Texas are now so big that they need more explicit autonomy, so that they can make more of their own decisions without interference. The D.C. Mandarins will call this a revolution. So be it. California and Texas must declare that this is not the United States of 13 states and 3 million people that adopted the constitution in 1789. Our country of more than 320 million is simply too big to be governed centrally from Washington, much less by the sort of people—first-term U.S. senators and reality TV stars—who get elected president these days. Our states deserve to be left alone to pursue their own destinies, with the federal government existing for little more than social insurance and national defense. Regular California-Texas summits would remind us that, while we will never be the most cohesive country, we are a collection of states that requires some unity. Indeed, the best argument for greater state autonomy is a democratic one. Our country barely passes as a democracy at the federal level, with a presidency often won by the candidate who lost the popular vote, a U.S. Senate that makes a mockery of equal representation, and powerful bureaucracies that defy accountability. You’ll have to figure out through negotiations what your joint agenda is. But conservative Texas will want to transfer more taxing and regulatory power back to the state and local level, while California will want more regulatory and financing power at the state level to pursue major progressive advances in climate change, health care, and immigration protection. But a concerted effort to demand greater autonomy for both states—pursued jointly through politics, lawsuits, and even a constitutional amendment—would be healthy. You wouldn’t be able to blame the federal government for your own follies. Instead, California might actually have to confront how its oppressive environmental regulatory regime has made it impossible to build sufficient housing. And Texas might have to face how its lack of planning puts its people in flood plains that stand in the path of hurricanes. And yes, I know you might miss the good times, when your states were politically aligned with the federal government. But admit it: Even those times weren’t easy, and your federal friends are never that friendly. President Obama, after all, was little help to California during its housing and budget crises. And President Trump’s trade protectionism is causing headaches for Texas, which has invested heavily in infrastructure and companies that support international trade, especially with its neighbor, Mexico. Your two states also have more common ground than you might think, even on immigration. While the federal government under Obama and Trump oversaw massive and inhumane deportation of your residents, your two states have invested in educating young immigrants, including the undocumented. It’s no accident that 350,000 of the estimated 800,000 “Dreamers” call one of your two states home. To get the talks started, California should immediately revoke its counterproductive ban on government-funded travel to Texas. Yes, the Lone Star State has some awfully discriminatory laws on adoption by LGBTQ families, but how do you change minds if you can’t meet with people? And you two governors seem to have a civil relationship: You issued joint statements about natural disasters and the Dodgers-Astros World Series last fall. Each of your states offers places where a visitor from the other would be comfortable. Why not start the talks in Austin, a chunk of California in the heart of Texas, where Apple employs more than 6,000 people? In California, I can see Gov. Brown taking his Texas counterpart to oil-rich Bakersfield, where you two could chat at Wool Growers, a terrific restaurant serving the food of the Basques—a people who know something about the fight for sovereignty. I’m not expecting you to produce the political equivalent of “Pancho and Lefty,” the iconic joint album of California’s late Merle Haggard and Texas’s Willie Nelson. (Though bringing Willie to the summit is not a bad idea.) But developing a strong working relationship will be important if Washington totally melts down, and creates a constitutional crisis for the republic, as many fear. In that case, California and Texas will have to put things back together. In the meantime, regular California-Texas summits would remind us that, while we will never be the most cohesive country, we are a collection of states that requires some unity. And that, in a country as diverse as ours, there may be no agreement as powerful as an agreement to disagree.